Grow fresh herbs & veggies all year round in this in-home garden system. Always fresh, always local, always in season. Up to 6 plants grow at a time, up to 12″ tall. Grows in water – no soil, no mess. Enjoy from plant to plate. Easy-to-use simple control panel tells you when to add water, reminds you when to add plant food (included), automatically turns lights on and off. Ultra-thin grow light hood with energy efficient 20 watt LED lights has 15-hour setting – just the right amount plants love for healthy growth. 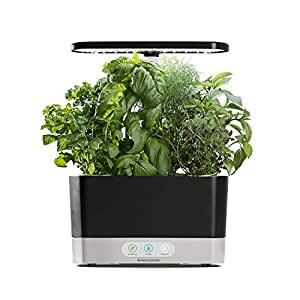 Includes 6 endlessly fresh gourmet herbs: Genovese Basil, Curly Parsley, Dill, Thyme, Thai Basil and Mint & Miracle-Gro Plant Food (enough for a full season of growth).